These signs let drivers know they’re entering the new ultra-low emissions zone. Apparently, London is on a mission to one-up New York City’s congestion pricing announcement earlier this month. The British city just rolled out the world’s first round-the-clock “low emission zone” to address its air pollution problem. Mayor Sadiq Khan formally introduced the new ultra-low emission zone rules Monday. The rules cover Central London, which already has congestion charges similar to what New York City rolled out to prevent more cars (and their accompanying emissions) from entering high-traffic areas. The new rules drop daily charges onto vehicles that don’t meet the city’s new emission standards. Cars built before 2005 will be mainly affected. These rules are all about protecting public health. Vehicles are responsible for 50 percent of the city’s nitrogen oxide pollution, and toxic air puts an average of four Londoners in the hospital every day due to asthma, according to findings from the mayor’s office. 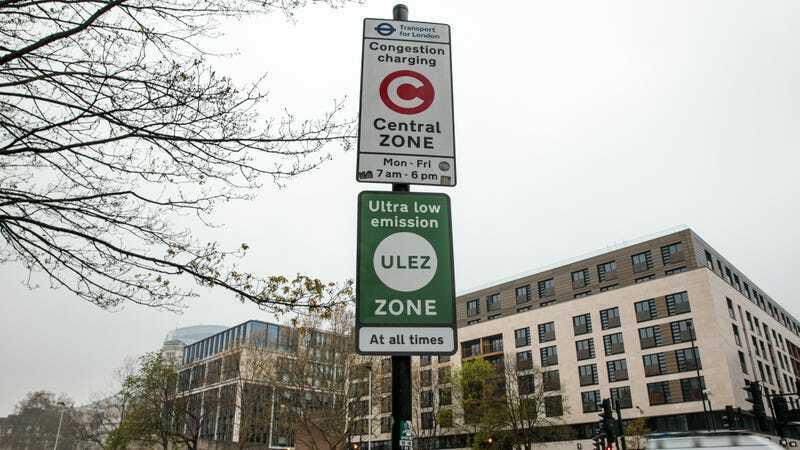 By limiting the types of cars that can enter this ultra-low emissions zone, the city is limiting the city’s total pollution levels. The Central London zone’s radius will expand by 2021 to beyond the London City Airport, according to the Transport for London. Those who decide to break the rules will face daily fines: 12.50 Euros a day for cars, vans, and motorbikes and 100 Euros for buses, trucks, and coaches. Seventy-five percent of all the city’s public buses now meet the emission standard, and it’ll be 100 percent by October 2020. More than half of the cars entering the zone already meet the standard, too. Mayor Khan didn’t just throw this onto the public. This ultra-low emission zone has been in the works since 2017. Since then, Central London has seen 11,000 fewer vehicles a day and 38 percent more compliant vehicles. Still, the city is aware that this is a dramatic and costly change for some. So those residents already living within the congestion zone, vehicles serving a disabled passenger, mini buses that nonprofits operate, and wheelchair-accessible private hire vehicles are exempt until 2021. Military vehicles, taxis, showman cars, and vehicles built before 1973 are also exempt from these requirements. Not everyone will love this change. (We New Yorkers weren’t all too happy about congestion pricing.) And it remains to be seen whether the changes will actually help reduce asthma among children—earlier low emissions zones haven’t, according to CNN. But cleaning our air and reducing emissions has to start somewhere.